My Mother's Story is a worldwide campaign with the mandate to encourage the writing, collecting, and performing of stories written by daughters and sons about their mothers. How have 20th century women really lived? My Mother's Story asks people to write the story of their mothers' lives from beginning to end, without embellishment, telling "just the facts ma'am." The 41 stories collected My Mother's Story: North Vancouver were submitted to Marilyn Norry for inclusion in a professional theatre production in Vancouver, Canada. Against the backdrop of headline news, they tell stories of wealth, poverty, abuse, adoption, arranged marriages, heartache and joy in countries all over the world, their common thread being a daughter who now lives in North Vancouver. 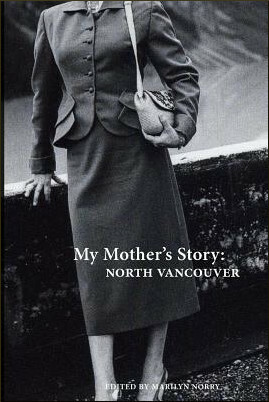 My Mother's Story: North Vancouver is the second book in a series on the extraordinary lives of ordinary women, part of a campaign that asks people around the world to record and share the story of their mothers' lives. The stories collected for the project have inspired and/or fuelled the development of an online Archive (www.mymothersstory.org), writing workshops, books, radio and film documentaries, a form of theatre and an entire social movement telling women's history... one mother at a time. Marilyn Norry is an award winning Canadian actor who has honed her craft on stage and screen for over 30 years. From this perspective she is able to see the extraordinary story potential in the lives of ordinary women as well as see how these stories could be told. Those insights started My Mother's Story and since 2004 she has used the stories gained in this project to stage readings, edit and publish books and lead workshops. She lives in Vancouver and continues to find ways to gather and tell women's history... one mother at a time.